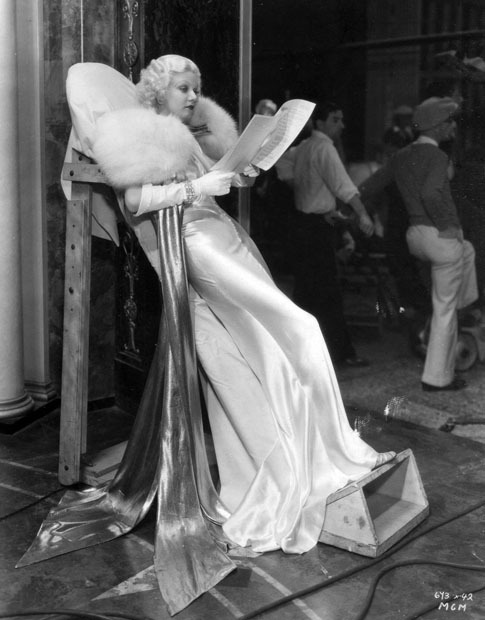 Jean Harlow relaxes on the set of Dinner at Eight (1933). Costumes by Adrian, b. Adrian Adolph Greenburg. Leaning boards ( also called Slant boards) were invented for Hollywood players to relax between takes. Frequently, the costumes were cut on the bias, and tailored so snugly that the actor could not sit down without bursting a ladder of seams. In fact, most of the time, there were no zippers or buttons on the costumes. Actors were sewn into their garments. So, when you see Jean Harlow in Dinner at Eight, and marvel at the impeccable fit of the famous white silk gown, be aware that Harlow’s mobility was severely limited. In fact, just breathing was something of a chore. These days, leaning boards are still in use, but they are the exception rather than the rule.